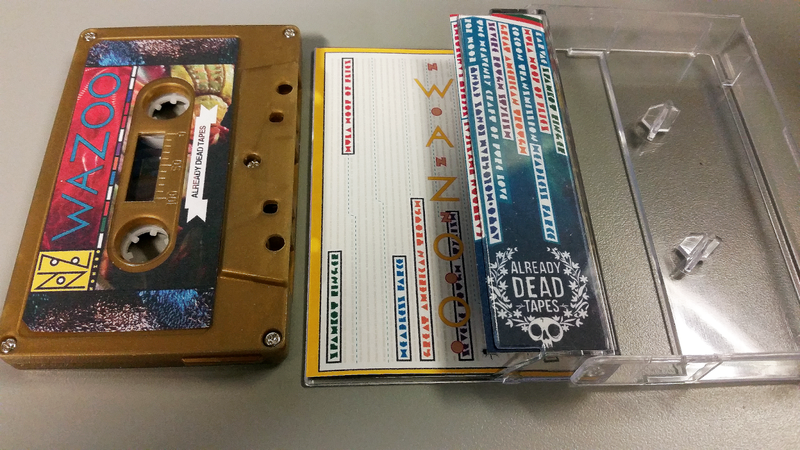 As I said yesterday in my review of their show at Roboto, here I am to review NONZOO's tape, WAZOO, which was released on Already Dead Tapes this year. 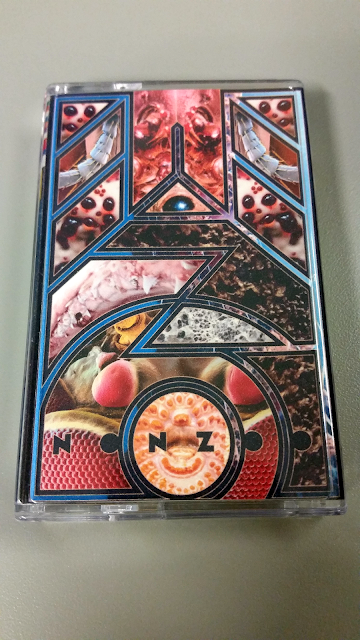 I liked the tape even just from the cover art with its bulbous, insectoid mosaic. 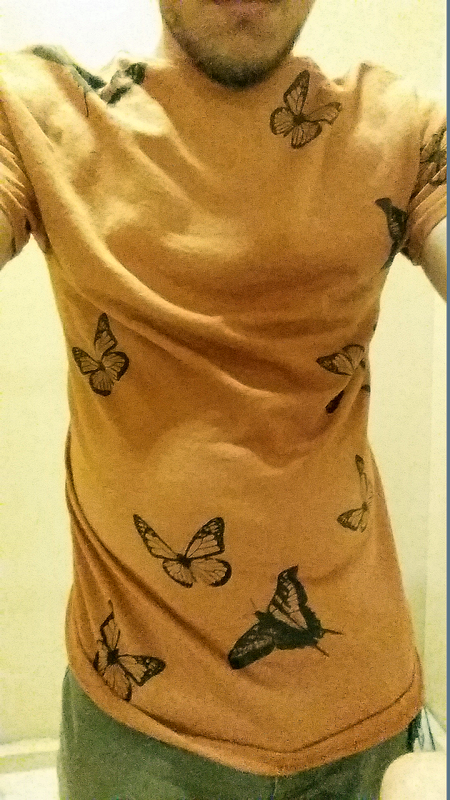 There are a few different variations of the cover, just like the shirt that I also got from the band. The actual cassettes are a gold color that, in this case, seems eerie. WAZOO starts with a glitchy noise anime intro called "LARVAE" that fades into the next song, "SPAMBOT RINGER", a song resembling Melt-Banana with more funky drums. There's a lot of textural guitar, computer-y noise, and drums that are thumpy and quiet. The vocals sound like a cool post-punk band (think The Slits or Mo-Dettes), shouting something like "bee! bee! bee!". Towards the end, things are pretty ragged instrumentally and vocally with some screams. The next song fades right in, "HULA-HOOP OF FLIES". At the start, there are some Siouxsie spooky vox and xylophone guitars. Before everything zooms out into the cyberspace of crystal spheres, there's some bubbling and Shaggs military drums. The title makes so much sense with this rhythm. "Alone inside her at last" (those words might be wrong), and then the song ends with a sort of "upset neighbor lady" voice from somewhere else. The "COCOON TRANSMISSION" comes in, somewhere deep inside, a scary place so confined with a green membrane. The twilling buzz is hypnotic. Maybe there are voices? It's too dark. Chants build up. "HEADLESS FARCE" is so fast and more "punk". It takes off and then "let's be quiet" and then jumps off and out again! The skittery angular guitar works well with the Macbeth-witch-like chant. The song breaks down into a slow decay, but there's one last gasp of backing vocals and springy guitars. Then it fades out in a wordless devil chant. Was sacrificed to The Insect God." But wait, there's more! There is a side 2 (who knew? - you probably, and me too). It doesn't start here, but the next track is a noted departure from this insect story. "GREAT AMERICAN TROUGH" does not fade-in. The strong guitar line really pushes the track. There are some strange percussions going on, and the instruments remind me of the Silver Mt. Zion side-project, Diebold, a bit. "Ooh the mystery!" The vocals are similar to David Thomas' on "Big Ed's Used Farms". "SEVERE ROUGH STYLISH" is a good descriptor to this band. Whoa, there's a heavy sound barrage, but overall this song is not as dense. The vocals are chirpy. Something drips into an intercom voice saying something about being scared of yr daughter. This one is scary, and it might be my favorite track. "THE HEAVENLY CRAFT OF PURE LOVE" sounds like it could be sincere or total irony with this band. NONZOO made it the latter; this is another creepy one! Someone is telling an eerie dream/memory about an amputation, and then a man, who sounds like he might have starred in The Blair Witch Project, comes in with another story that I can't make out. Demonic voices fill the air, and then we are back to the room with the first storyteller talking about controlling yr dreams. "CARTOON PHYSICAL" is another big break - it comes in swinging like lounge jazz accompanied with airy vocals. Then there's a very cartoony voice, a lot of vocal manipulation, and maybe backward voices (please tell yr mom and the pastor!). It ends with a cough, so I assume the title refers to a physical in the medical sense. "SECRET LANDFORMS" is a great name for a song. There are great space sounds and some zoomed out ambient parts above the fields beyond the fields that we know. This song is a little long, as is, almost, the next one, "AUTO-HOLOGRAM BONUS EVENT". The musick comes in from a different room with a really solid track full of zipper-y bass. When I thought it was getting too long, many voices spoke out around the room before screams and a horn pileup. This one has a very good end. Speaking of the end, "ROOM 202" is the last track, fading into a different world, alone outside at a temple on the edge of the world. A hot wind comes in from the left field. A spectral voice vibrates in through the veils of worlds, chorusing together to reveal itself emanating from human-cricket hybrids that begin to gather, revealed when the fog clears over the autumn leaves. Is it another holy ritual? An alien abduction? A surgical procedure? You know, I saw something staring back at me from the space between the stars, big eyes, and long hands, fingers of grey ash bones. 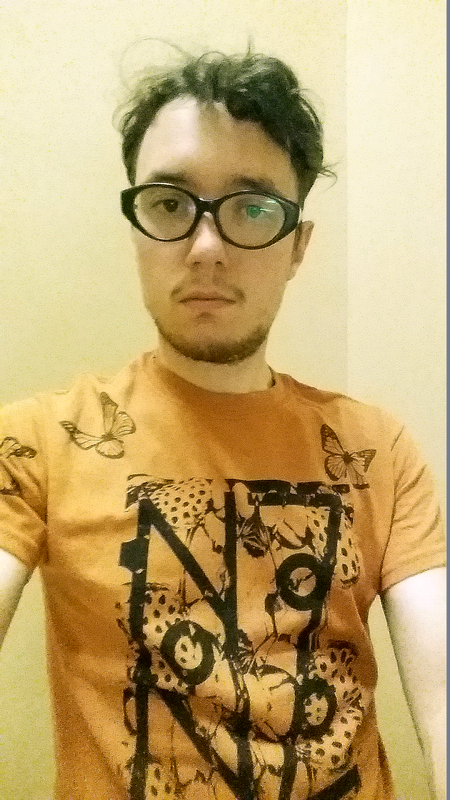 Slime drips down my face as the many-eyed worm encircles the top of my head like a cold, damp leech. I want to scream. Distantly, there are others here, somewhere, screaming in fear. Maybe something vomits? Then the wicked laughter mocks us all before a bell rings. Time to snap out of it. Wow. WAZOO is an amazing album. It almost becomes formulaic, but it never reaches that point with the strange soundscapes and non-rock guitars. The songs are similar but also quite varied. It sounds like the pasta, jackfruit, and eggplant dish I ate before the review tasted - alien, squishy, and too sweet. I screwed up with the food, but NONZOO did not screw up with WAZOO. NONZOO compares favorably to Melt-Banana, but this is better; I am not a fan of all of the yelps from Melt-Banana's Yasuko and the samples they use. The production on WAZOO is great, though the drums should be a bit louder. This album gets a GOOD. This rating can be in all caps - why not? Along with Aunt Dracula's Freaker, it's been one of my favorite albums this year.